My copy of American Nerd came in last night, and it proved to be a fairly short read, only 222 pages, which took me the better part of my evening to get through. While it is very short and somewhat abbreviated, it proves to be an interesting read that brings up some interesting points about American Nerd culture. 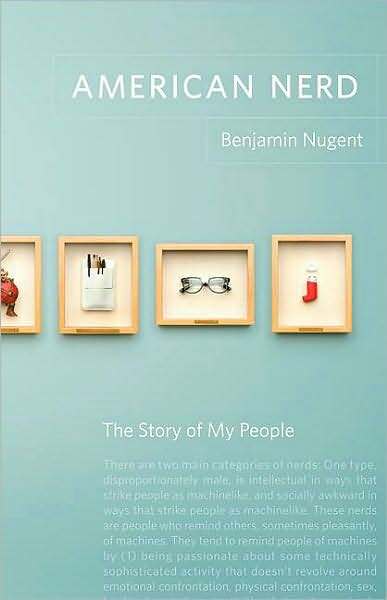 Ben Nugent's book seeks to examine the roots and definition of the Nerd. In doing so, he teases out two large factors in culture that have helped bring about the popular nerd image, and that's isolation from the main population and an affinity for rules and structure. From my own experiences and observations, these are relatively accurate assertions that these elements do help to influence those who call themselves nerds or geeks. Nugent's book looks to history for some of the background on the subject. What I found most fascinating was his take on elements of the progressive movement on society and how this has some root causes for nerds and for why they are generally abused by popular culture in general. One thing that is made clear - nerd/geek culture is created, in part, by isolation from the rest of the population. Nugent goes back to the 1880s to the first Ohio school that introduced mandatory physical education, through to Theodore Roosevelt and building of a 'all American' sort of culture. Athletics in schools, by nature are exclusionary - they seperate out the weaker, meeker and smaller. There are many tales of the nerds/geeks in high school being picked off one by one by one in dodge ball. One aspect of this is duality, a theme that comes up multiple times throughout the book, and through different means. Nugent brings up several racial and social theories to help explain this. One example of this is how he examines and compares geeks vs. jocks. Jocks tend to draw more from the animal side of the spectrum, tend to be more empathic and emotional while geeks tend to veer more towards the machine side, where logic and reason take precedent. The animal, emotional and empathic side of things, because of the progressive movement, has become the more accepted social position in the US. While the book does take a good look at the background history of nerds in the US, there are serious flaws in the book's structure. It bounces from history to social theory to biography and guide to nerdom, with very little overall flow. While the book brings up a number of points, is up to date (items such as Robot Chicken, Freaks and Geeks, Battlestar Galactica and other geek fare) and is fun to read - it doesn't get drowned by the bulk and density of some historical events. This book is too short and doesn't go far enough to examine the history and cultural factors in nerd/geek subculture. The history is abbreviated and the methodology is inconsistent. There is no bibliography, despite his criticism of another book of not having one, although there are some footnotes throughout the book. While it purports to examine the story of Nerds in the US, there are some very obvious gaps here that undermine the history. There is no discussion of the rise of computers - I don't believe that Steve Jobs is mentioned with the creation of Apple computers, nor is NASA talked about, which seems like a huge thing to overlook when talking about geek/nerd history. Nor is there any discussion on the impact of Sci-Fi films during the 70s and 80s. There's some talk about Tolkien's Lord of the Rings, a little more about Dungeons & Dragons, but there's precious little talk about the impact of these huge juggernauts on the geek/nerd community. While it's unreasonable to expect that this book would be anything comprehensive (or any book on history, for that matter), leaving things out such as this seems to be a gross oversight. To some extent, this book feels uncompleted. There are short sections that cover a broad range of subjects, so it feels like it covers a lot of ground. This is good, but unfortunately, it only seems to cover the surface of much of the issue. That being said, it is an interesting read. It's certainly a book that can be expected as nerd-culture has gotten far more popular in recent years. The best thing that we have here is a good definition of the term, of the entire population that's out there. It's a good start, and hopefully, we'll be seeing some more work in this aspect of history soon.